Batman vs Superman is slowly beginning to pick-up steam with constant rumours; such as the first trailer reveals and the appearance of Ben Affleck's' Batman on the set of Suicide Squad. Recently rumors began to kick up that the main antagonist of the film will in fact be Superman's long standing arch-nemesis Lex Luthor (Jesse Eisenberg). This rumor however had a little twist added on to it. Luthor will have a major weapon of his own. His accomplice will be the infamous villain that caused the “Death of Superman”. Doomsday will be the secret Luthor plans to unleash to fulfill whatever evil plan he has up his sleeve. Lex Luthor has been a staple villain for Superman and one of the only pure human villains to remain in DC's spotlight. Despite having no powers of his own, he still manages to be a thorn in the side of the Man of Steel. Luthor a well respected businessman in the eyes of everyday citizens, feels that Superman should not be looked up to or be the savior of the world due to him being an alien and not from this world. Instead he feels humans should be the ones to take ownership the world. Historically, one of his first steps is creating a battlesuit from experimenting on General Zods armour. Yet another rumour is going around stating that not only is Doomsday going to be a huge threat to the Last son of Krypton and the Dark Knight, but that Luthor will put on the famous purple and green suit for a fight against Superman. The warsuit has been a mainstay for Luthor in recent adaptations; making him not only a foe that can potentially outsmart Superman but also someone who can pose a physical threat as well. 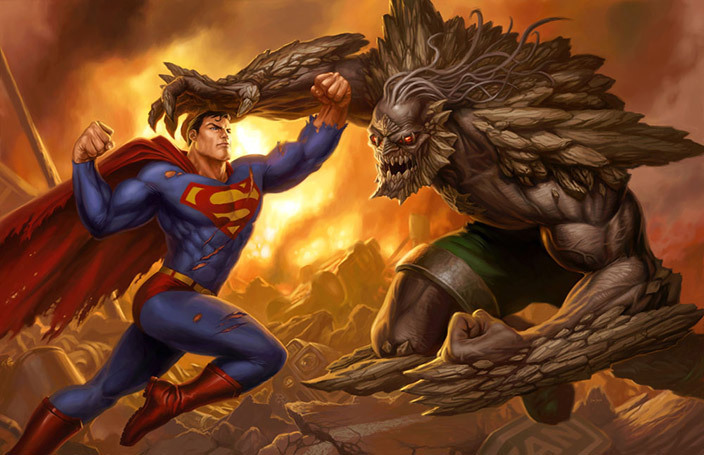 The rumor that Doomsday - the creature that killed Superman - will be in Batman vs Superman caused many comics fans to cheer that we will finally get an enemy that can literally cause Superman to bleed without kryptonite. Doomsday, who has been one of the meanest and strongest enemies in the DC universe, was most recently featured in the "Superman: Doomed" story arch as well as being referenced in the new comic “Doomed”. He has not been shown on a screen of any size since the adaptation of Smallville and a few animated movies. Doomsday as a character is an unstoppable killing machine that has been a huge problem for Superman seeing as whenever Doomsday dies he regenerates and adapts making him immune to whatever killed him. This is due to how he was created. Doomsday was created on ancient Krypton before the Kryptonians became the dominate race on the planet. An alien scientist named Bertron experimented on the harsh planet's environment using a child born from in vitro. This humanoid child was sent into this horrible landscape. Every time the child died from the environment or from other means the scientist would retrieve the corpse of the child and then would clone him making him adapt to what killed him before. Decades of repeating the process cause what we know today as Doomsday. After becoming strong enough Doomsday retaliated on his creator and killed him. After which hitched a ride on a supply ship. This creature wrecked havoc across the galaxy until he was finally caught and locked away in a type of coffin. Until he landed on earth and began what we know today as “The Death of Superman!”. The addition of Doomsday will be very interesting if the rumor pans out. This is due to the fact that many if not all of the future Justice Leaguers are supposed to be cameoing in the film. Could this be the way they bring these heroes together? One theory about this is that Luthor manipulates Batman and Superman to fight one another either using Doomsday and blaming it on one of them or tricking them to fight one another. Than once they figure it out both Batman and Superman go and begin to fight Doomsday to which they can not beat alone and instead get help from the future Justice Leaguers, thus kicking off the first phase of DC Comics cinematic universe.